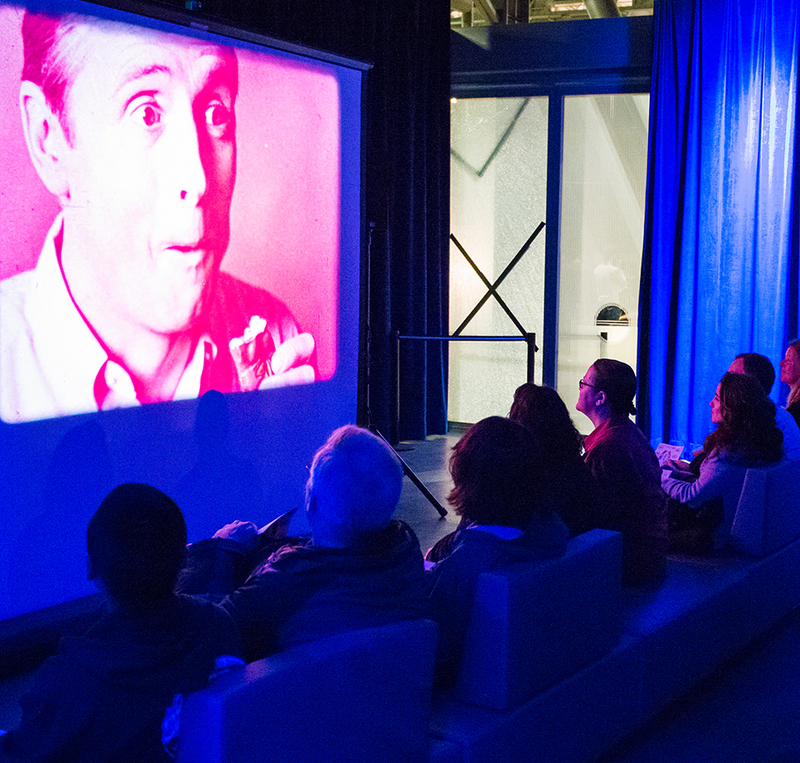 Thursday, March 1, 2018 • 6:00–10:00 p.m.
Contemplate cinema’s continuum at After Dark. Traverse a timeline of motion-picture technology, from the earliest hand-drawn, hand-cranked experiments to cutting-edge experiences that aim—again—to redefine what cinema may be. 7:30, 8:30, and 9:15 p.m. Using software as an instrument that generates sound-responsive images in real time, NOS Visuals creates a holistic conversation between sound and visuals. Tonight, visual artist Osman Koç collaborates with sound artist Amma Ateria along with guest musicians Kevin Corcoran and Andrej Hrončo to present three different sets of immersive visual music. Much like emojis have become an accepted part of the texting lexicon, so have the short, snappy animations known as GIFs become a frequent feature of digital communications. Enjoy this curated selection of artful, clever, and surreal animations designed for the computer age. An homage to an ancient technology, Video Weavings reflects the warp and weft of textiles in the horizontal and vertical scan of television. Artist Stephen Beck designed and built his first Video Weaver synthesizer in 1973. The Exploratorium is Herbie’s dance floor and he wants you to take a spin with him. Join in and dance with Herbie in this reactive installation. 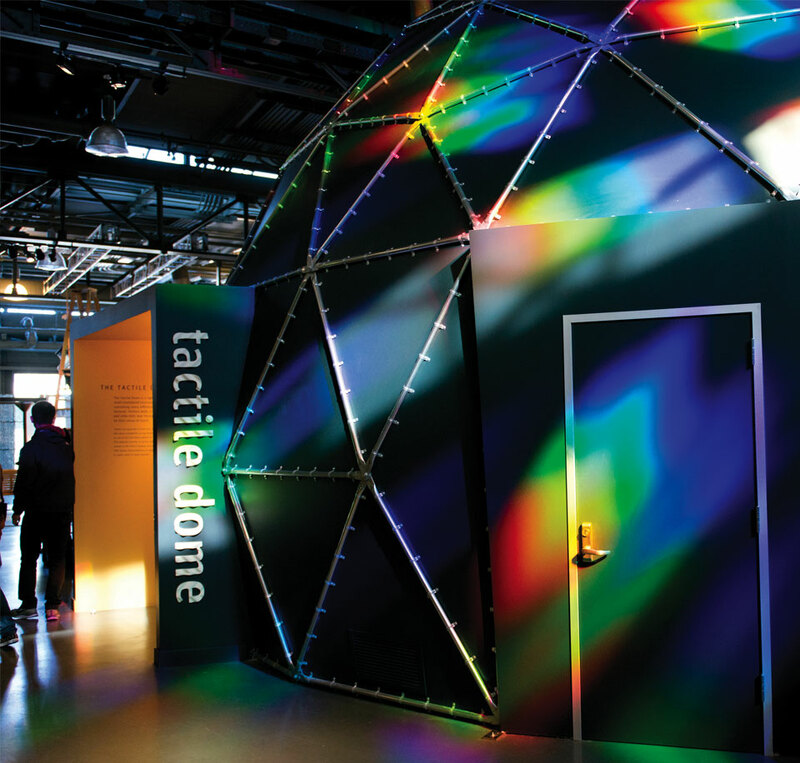 This immersive kinetic installation by Eric Parren celebrates light in its purest form. As a pulsating pattern of complementary colors is projected onto a reflective surface, its undulating movement distorts the rays of light. Join staff from BAVC’s preservation team to see historic video technology in action and glimpse the careful process of video preservation. Experiment with tools that can manipulate a video signal and transform any videotape into a real-time artwork. Wade Wright shares his collection of Red Raven Magic Mirror records from the 1950s. As the 78 rpm records play, their labels reflect off a faceted mirror placed over the spindle, creating a looping animation to music. ​This slate of 16mm films, projected on giant scrims descending from the ceiling, features works that consider, examine, and celebrate the physical qualities of celluloid and the act of watching film in motion. This informal microcinema features four curated sets of dazzling short works. Viewers can step in at any time during the night and be guaranteed to find something intriguing on screen (details found on program notes at the entry). A descendant of the mid-19th century moving panorama storytelling tradition, this exquisitely rendered painted scroll will be unrolled complete with live Foley effects and narration, imparting an idea of the thrills and dangers undertaken on a seaboard trip around Cape Horn to reach Gold Rush–era California. An art form developed in the 19th century, crankies employ simple mechanisms to hand-crank paper scrolls that result in moving images. 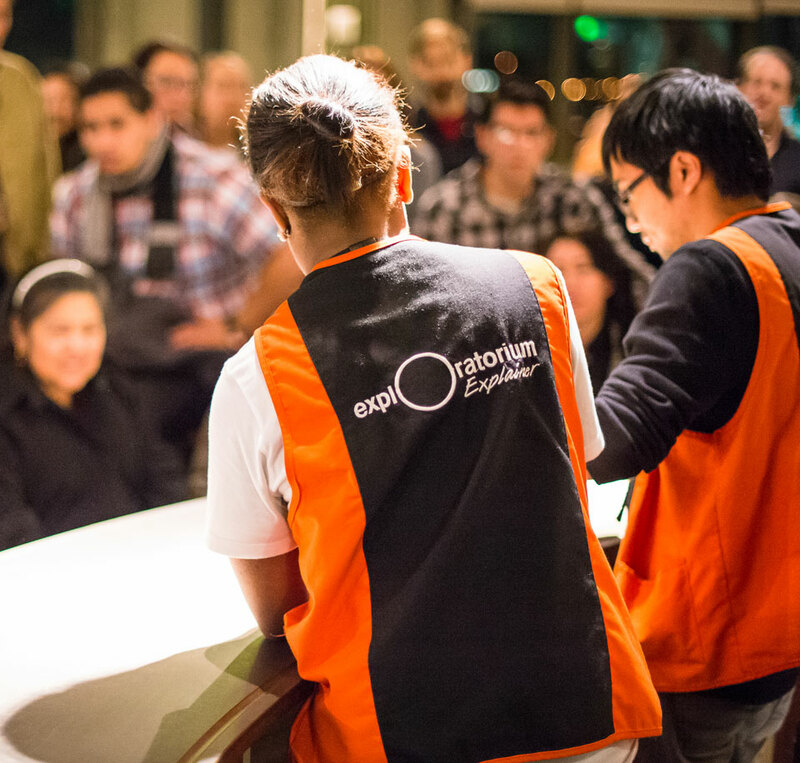 Grab a milk carton and scroll and join our expert Explorables volunteers to craft your own moving panorama.